Lyon was the most important Provincial centre in the Roman Empire. Roman Lyon began up on Fourviere hill - the name comes from Forum Vetera, the Old Forum. Julius Caesar ran his campaign in Gaul from there. Here's the men who won Gaul for him. 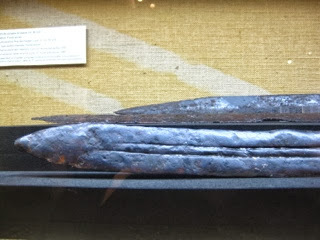 And here's a Roman sword. In the years after Caesar's assassination the Romans built a whole new city, Lugdunum, down on the flat where the Rhone and Saone rivers met. The Emperor Claudius of "I, Claudius" fame (Harvey loved the book and the series, but he'd also read all the serious history around them) was born in Lyon. 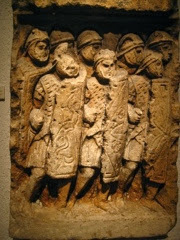 The treasure of the Gallo-Roman museum is the Claudius Tablet, where he granted local Gallic dignitaries (but no freedman, slaves or women, of course) the higher status they wanted. The whole thing, made of black basalt, weighed hundreds of tons - only two pieces of it were found. Isn't the lettering beautiful. 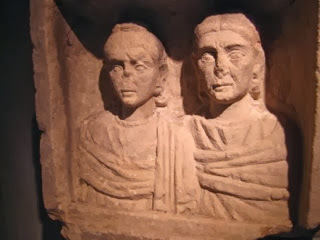 And to redress th balance and bring in some women, here's a rare funerary portrait of a Lugdunum mother and daughter, around the 3rd century of our era - they can be dated by their hairstyles. I love that lettering; it is very even. I would be ruling lines if I was doing such lettering on paper. I wonder what they used to keep the lines straight? I've stayed in Lyon but didn't realise its significance, so it's nice to be filled in. I'm puzzled by the word 'currish' in the Mason poem. Does it mean 'churlish'? So jealous! 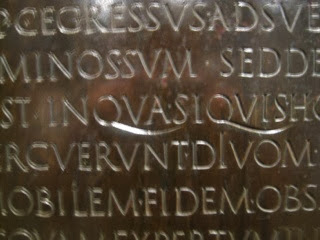 I have always, always wanted to see the Claudius tablet fragments... I remember having to present a tutorial session on them in Stage II Latin. What a lovely trip you are having! Sorry you couldn't have been with me - and how lovely to have a reader like you who knows all about it.